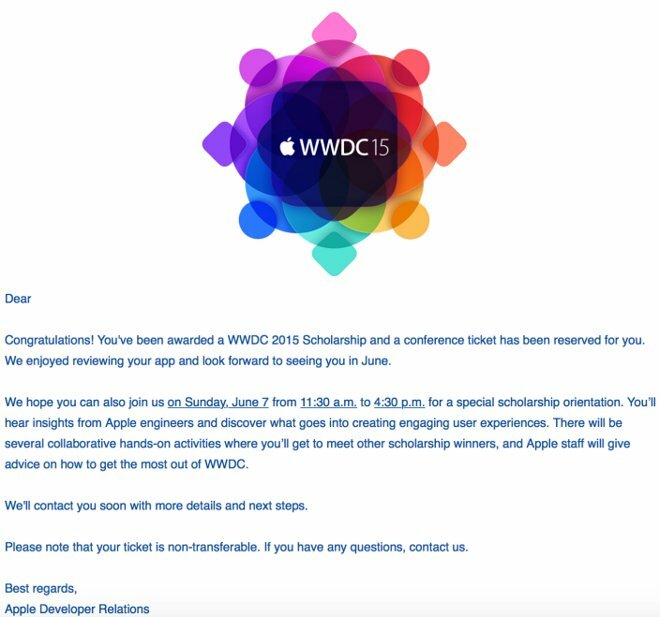 Apple on Friday began sending out scholarship notifications for the 2015 Worldwide Developers Conference, giving lucky winners a chance to get into the event without paying the standard $1,599 ticket price. The notification email, being shared by many people on Twitter, mentions that scholarship winners are invited to a special orientation session scheduled from 11:30 a.m. to 4:30 p.m on June 7. There, the company promises talks by Apple engineers, along with "collaborative hands-on activities" where fellow winners can meet each other. The conference itself starts on June 8. Apple is handing out 350 scholarships in all, an increase from the 200 offered last year. In addition to ordinary student developers aged 13 or older, the company is reaching out to members and alumni of 20 organizations devoted to promoting STEM (science, technology, engineering, and math) education. Some examples include Black Girls Code, Code.org, and LaTechLa. All of the regular full-price tickets for WWDC, issued by lottery, have already been sold out. Notifications were sent last month. WWDC is important for developers not just as a way of bolstering skills but as the first glimpse at future Apple products. The company is expected to showcase not just iOS 9 and OS X 10.11, but a new Apple TV, and possibly streaming music and television offerings.